Your wedding will be shot using two discreet cinema style cameras, cinematic lenses, and professional audio recording devices. It will be edited carefully and time will be spent in editing to determine the correct angle is chosen at the perfect time. I pride myself on recognising when people are looking their best and I only show people in their very best light. I also use an aerial drone if the weather permits (included in price) . 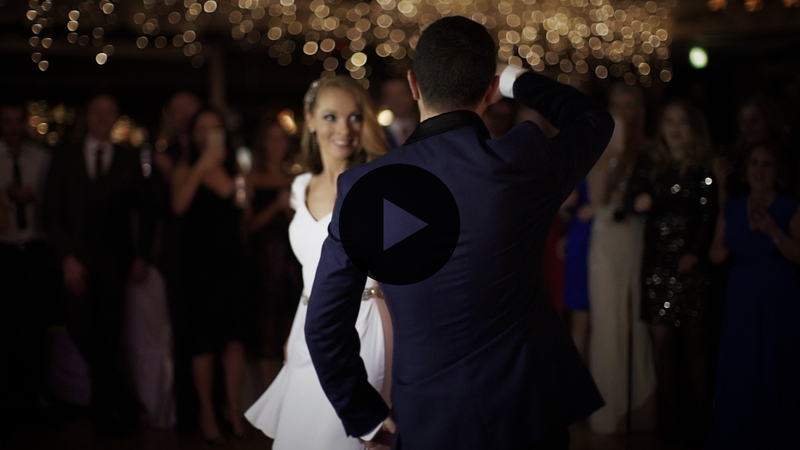 A 20 minute film to tell a comprehensive story of your wedding day (Full Ceremony & Speeches included as an extra chapter). Here is a detailed breakdown with samples of the different stages of the day and the coverage you will receive. Coverage begins at Bridal Prep at the brides house/venue on the morning of the wedding. I create a sequence ranging from the finishing touches of the makeup being applied to the Bride being fully ready. I get beauty shots of the Dress, Flowers and other items in theme with the day. Shots of the girls in their gowns having the craic also makes the final cut. When the time comes to get in her wedding dress I film the finishing touches of that process – dress being fastened at the back along with Jewellery , Shoes and Veil etc. When the flowers are handed to her and she is fully ready I get my Final shot of her before I head for the church. The Ceremony is filmed with 2 cameras and professional audio devices. I edit the ceremony down to a more watchable and entertaining few minutes containing the key moments. The full Ceremony is also included seperately as an extra chapter. When the ceremony is finished I shoot shots of the Signing of register and the married couple walking down the isle. I get shots of the Bridal Party and parents congratulating the bride and groom. At this point I turn my attention to the church grounds where guests meet each other and I generally wander around getting socialising shots right up until the family photo session begins. Assuming the photo session happens at this stage of the day this is where I learn who the couples family members are and can get some nice shots of them. I tend to concentrate my efforts on the Elderly and the Children during the family photo session intercut with some group shots. I then concentrate on shots of the couple leaving the venue and getting into the car. I then work with the photographer to gather creative shots of the couple during the photo session. This is heavily edited into a personal & romantic sequence. I will use beauty lenses and even a drone if the weather allows to gather the perfect shots. I capture the couple arriving at the reception along with the festivities at the time. I find time to get shots of the room and cake along with more guests socialising and the funtion room filling up. I capture the bridal party and couple entering the room. The speeches are recorded in full with 2 cinema style cameras. Generally one camera is on the speaker and the other on the person being spoken about. The full speeches are provided as an additional chapter. I do make a short visual sequence out of the speeches also to use within my film. Shots such as hugging, tears, cheers etc make the cut. I then film a short sequence out of the cake cutting. I gather creative shots from the first dance and the next 15 minutes after that to create a music sequence of this part of the day to close out the film. Bridal Prep included , Groom Prep included if at same location as Bridal prep. 20 minutes of Dancing Coverage. 20 minute feature film Included. Cinematic Highlights. A 4 minute love story that is centered on the wedding couple and their wedding day (please see my many samples online). This film should demonstrate the Editing style of the Feature Film. This particular example however involved a Groom Prep as well as a Bridal Prep and the Groom Richard spent some time preparing a letter for the Bride to read. He asked me to deliver the letter to her, which I did but not before I got a recording of him reading it out. Although recording audio is not for everybody I do think it worked nicely in this particular example.